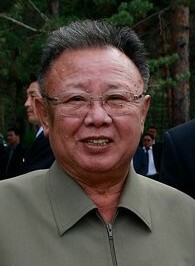 Kim Jong-il, North Korea’s leader for over 17 years, died on December 17 due to medical reasons. He was 69 years old, and one of his titles was “Dear Leader”. His youngest son, Kim Jong-un, is the new leader of the country, and has been given the title “Great Successor”. North and South Korea were part of a single country called Korea for over four thousand years. In 1910, the Japanese occupied Korea and ruled it until the Second World War. When the war ended in 1945, the Japanese had to give up control of Korea. Korea was then occupied by the Soviet Union in the north and the United States in the south. A line in the middle (called the 38th Parallel) was drawn and two countries were created in 1948 – North Korea and South Korea. North Korea has been led by people from the same family since it was founded. Kim Jong-il’s father, Kim Il-sung, was the leader from 1948 till he died in 1994. Kim Jong-il became the leader after his father’s death, and now his son is the leader. Kim Jong-un is in his late 20s. It is believed that he did part of his schooling in Switzerland, and loves basketball. His hairstyle, longer hair on the top and really short on the sides, is very popular amongst young men in North Korea. The North Korean government very strictly controls many aspects of its citizens’ lives. It is very difficult to visit North Korea and for its citizens to leave. People don’t have access to many gadgets and conveniences. It is believed that there are food and power shortages in the country. There isn’t much communication between North Korea and most of the world. North Korea’s biggest trading partner is one of its neighbors, China. However, it doesn’t get along with another of its neighbors, South Korea. After the two countries were created, North Korea attacked South Korea in 1950, starting the three year Korean war. When the war ended, the border between North and South Korea became the most guarded border in the world. North Korea is about the 50th most populous nation in the world, but is thought to have the 5th largest army. The capital of North Korea is Pyongyang. 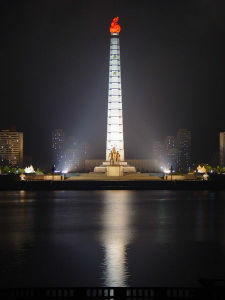 The Juche Tower is a famous landmark of the country. Image credits: www.kremlin.ru for Kim Jong-il photo; Martyn Williams for Juche Tower photo.